Remove about 1 tsp (5 mL) frosting from top of each cupcake. Set aside. 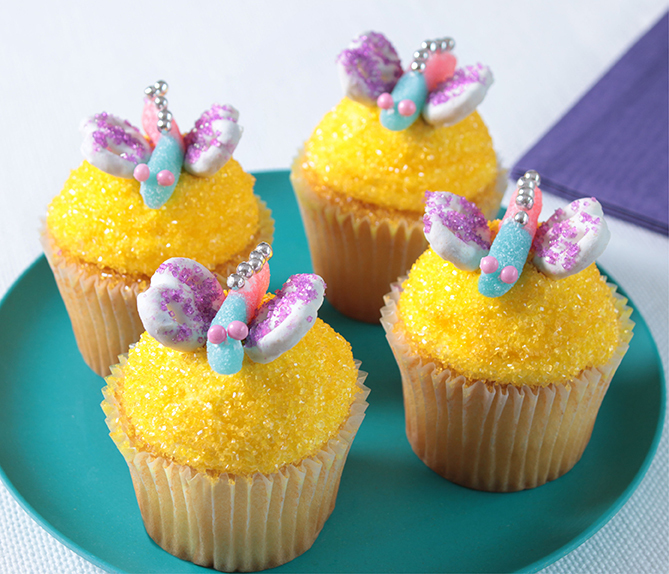 Dip tops of cupcakes in yellow sugar to coat, pressing slightly to flatten. Spread some of the reserved frosting on each gummy worm to coat. Arrange 2 pearl candies on one end for eyes and 5 silver decos down lower end of gummy worm. Place in center of cupcakes. Brush yogurt pretzel twists lightly with water using a small paint brush. Sprinkle with colored sugar. Place one on each side of gummy worms for the wings. Pretzel sticks also work well for the bodies in place of the gummy worms.